This year I made just the one handmade Xmas gift, which was totally unplanned. Jon had ripped out a picture of this posh looking Drake's tie from a copy of Time Out, complete with £125 price tag. So three days before Christmas I hot footed it down to Goldhawk Road to hunt for some fabric. As the schools had broken up I had Charlie with me and I knew it would have to be a lightning quick visit (he's not keen on lingering in shops, unless they happen to sell watering cans). In the end I had to bribe him with lunch at Pizza Express, but it was well worth it because I found the perfect fabric pretty quickly. It was from a new, posh looking fabric shop called Misan West, which isn't the cheapest, but has lots of good quality suitings and silks. I bought a metre of Prince of Wales check lightweight wool suiting for £15 and the girl kindly added a bit extra in case I mucked up. I didn't muck up as it happens, and as the fabric is quite wide, I still have enough for a pencil skirt if I so wish, hoorah! For the lining I used some scraps of Venezia lining fabric left over from this skirt. Sadly my tie making partner in crime - Joe - was busy doing a panto run (he's a fabulous Ugly Sister in Cinderella if you're interested!) and I must admit, I missed his expertise. I also realised he had all the tie patterns we'd worked on together so I had to improvise! I remembered that there was a tie in the Sew Over It Vintage book, so set about drafting one from the book myself. I made a couple of small changes: lengthened it by 10cms to match an existing tie and narrowed the bit that goes around the back of the neck so that the shirt collar would cover it. The drafting took one afternoon and I spent another afternoon actually sewing it. 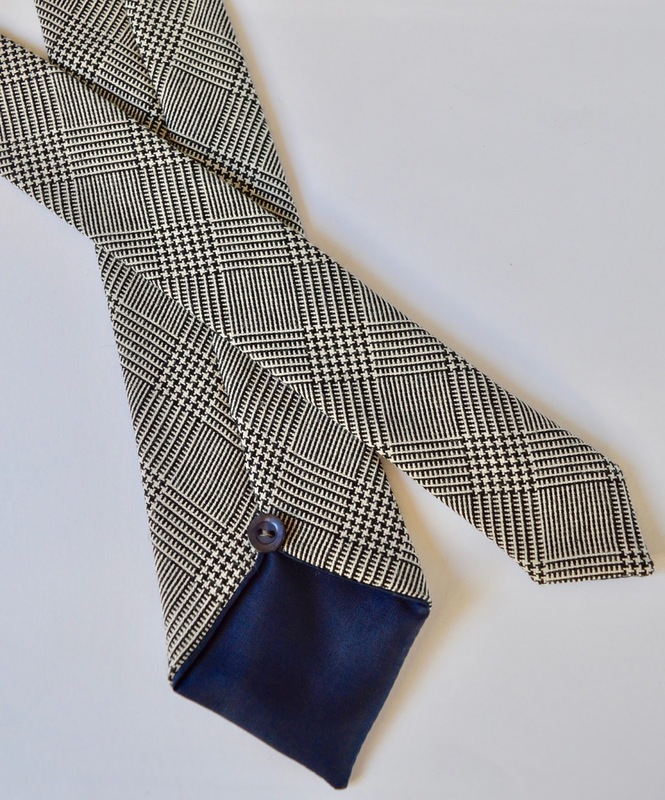 There are only a few bits of machine sewing involved, the lengthy parts of the process were spent at the ironing board and hand stitching the central seam. 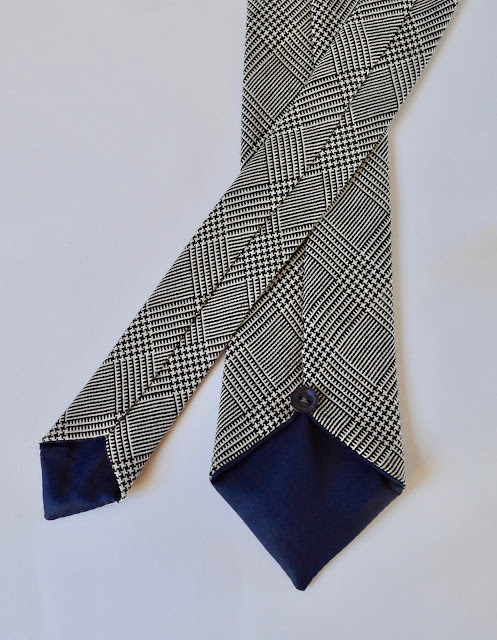 Apart from the obvious difference i.e the posh Drake's tie is silk and the one I made is wool, I don't think they're that different to the untrained eye. 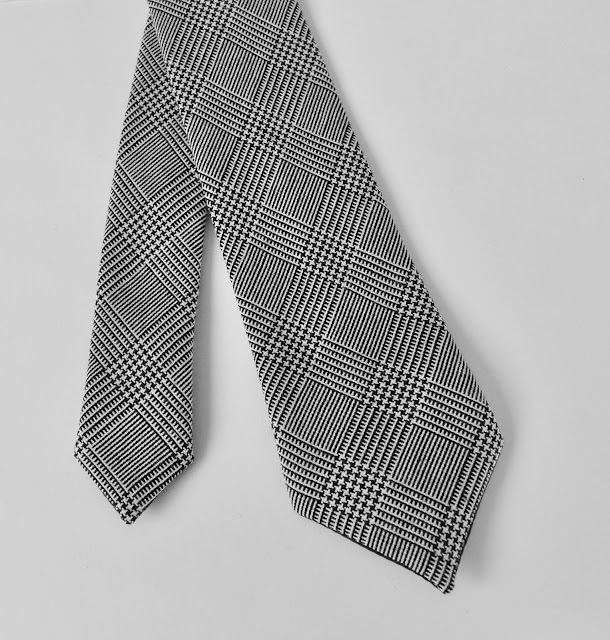 I couldn't adjust the colour properly on my photos, so you'll have to take my word for it that my tie is much lighter in real life - the colours and checks really are very similar. And Jon's face on Christmas Day when he realised I'd made it was a picture! Seasons greetings! If you follow me on Instagram, you'll have already seen me crowing about the Simplicity party top I reviewed for the current issue of Sew Now magazine - oooooh! Simplicity 8260 is an easy-to-sew top in two lengths, with a choice of sleeve options and an unusual cross over back. It's an elegant, drapey style with lots of ease, so I'd suggest choosing your size based on the finished measurements rather than your actual measurements. According to the body measurement chart I was a Medium (14-16), but I went ahead and cut a size Small (10-12) with no regrets. 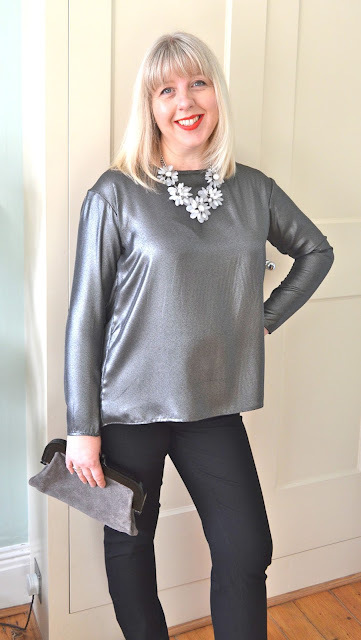 As I was reviewing this pattern in December, I thought the long sleeved version would be the most weather appropriate (although I really like the look of the sleeveless version), and I chose the longer length (view B). The pattern requires minimal fitting and I made no changes to the pattern. The only thing I would mention is that the full length sleeves are quite fitted. I personally prefer this, but you may want to add a bit of width if you don't like such a tight fit. There are only three pattern pieces (two if you go for the sleeveless option) and no darts or fastenings, so construction is very simple. One thing to note is that the back pieces are cut on the bias and liable to stretch out. I'd recommend stay stitching these edges before you begin to prevent this happening. The two back pieces are crossed over each other and basted together to form one piece and the sleeves are inserted flat, so the entire top comes together very quickly. The pattern recommends using bias tape to finish the back opening edges and hems, but I didn't actually finish mine this way. I bought some lovely metallic bias tape which I didn't use in the end, as it ended up distorting the edge of my lightweight fabric. I finished my edges with narrow double turned hems instead. 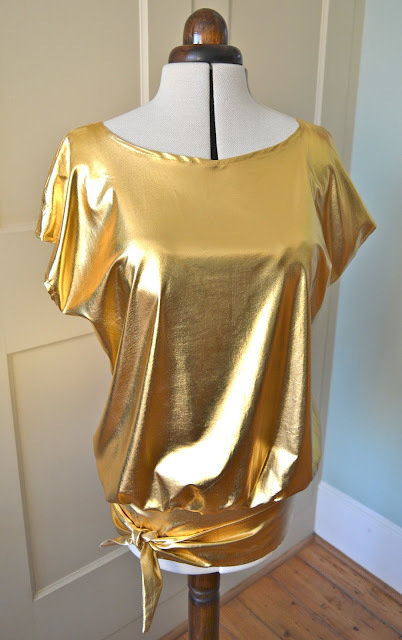 The fabric was quite sheer and any hem rippling around the neckline would have been really apparent, so I drafted a simple facing instead, using the front and back pattern pieces. This gave a much cleaner finish to the neckline. I also used French seams throughout. The fabric itself was rather lovely and came from Clothspot, a new-to-me online fabric shop with a carefully curated selection of gorgeous dressmaking fabrics. 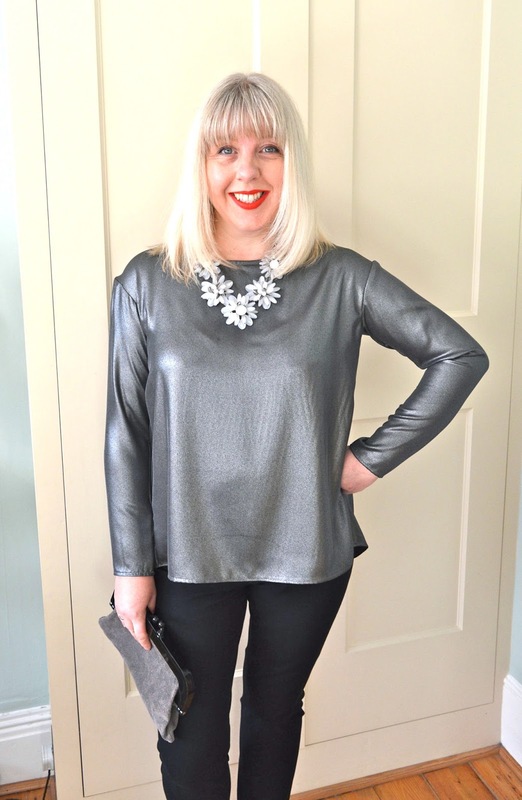 It's called 'Mercury Falling' and is a fluid, metallic-silvered lightweight crepe. All of the fabric descriptions on the site are very detailed (which I appreciate) and they even include a video clip of this particular fabric in motion! It's supposed to be hand washed to avoid damage to the metallic in the fabric... I simply crossed my fingers and machine washed it on the hand wash cycle. A tiny bit of metallic in one corner came away, but otherwise there were no ill effects. It does require quite careful handling - don't forget to stay stitch bias edges as pointed out above, and be vigilant when pressing hems to avoid rippling. I needed a fabric with a fair amount of glitz, that also had some drape to it and I have to say, 'Mercury Falling' delivered on both counts. The fit of the top is a bit of a departure for me (the shoulders are dropped and there's no shaping to the front) and I quite like the elegant effect it gives. I also like the fact that it's plain and simple to the front, but turn to the back and there's a party going on. I have to admit, I haven't worn the top out yet, so can't testify to the wearability of the crossover back. The back pieces on the pattern envelope seem to cross further down than my version, which might be down to artful photography. I may end up tacking the back pieces together if I feel like I'm wearing a hospital gown - I'll report back on that! The pattern and fabric were given to me free of charge by Weaver Dee and Clothspot for review. All views my own. 2016 has been a good dressmaking year for me. I haven't been as prolific as in previous years, but that's because I've been a bit more considered in what I choose to sew. I've concentrated more on fit and fabric choice and this has definitely resulted in fewer failures and unworn garments! 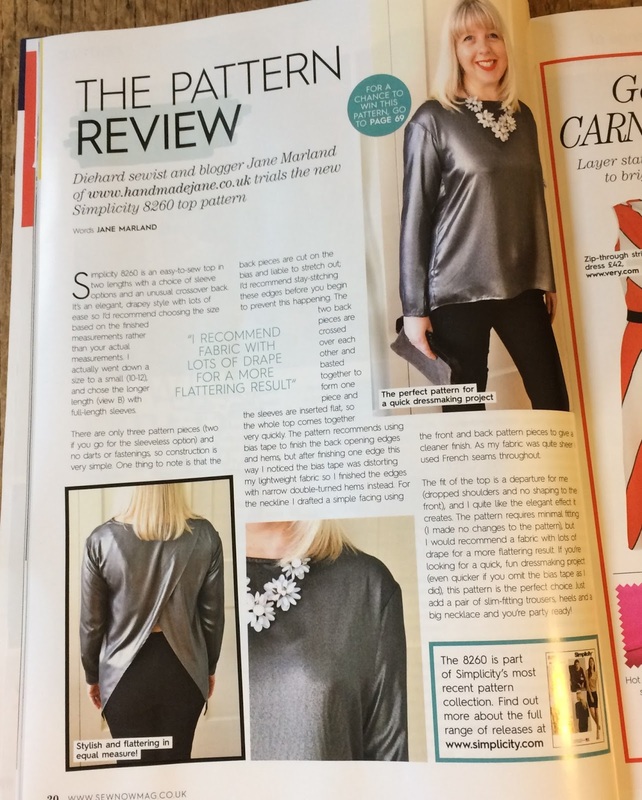 The pattern that has without doubt, been the biggest hit of my sewing year has been New Look 6217. It may be a plain, unprepossessing little pattern, but it always seems to magically come up with the goods for me. The top and skirt both fit me straight from the envelope and are very easy to sew. My favourite of the five tops I've sewn is still the first one, made with black satin-backed crepe. 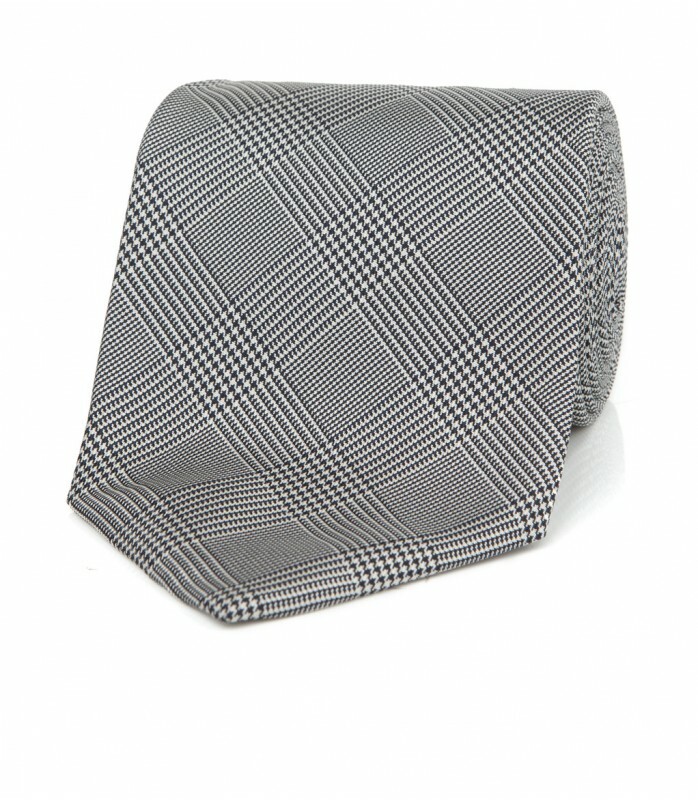 It goes with everything and always looks classy. There's a round-up of all my other versions on my OWOP post here. 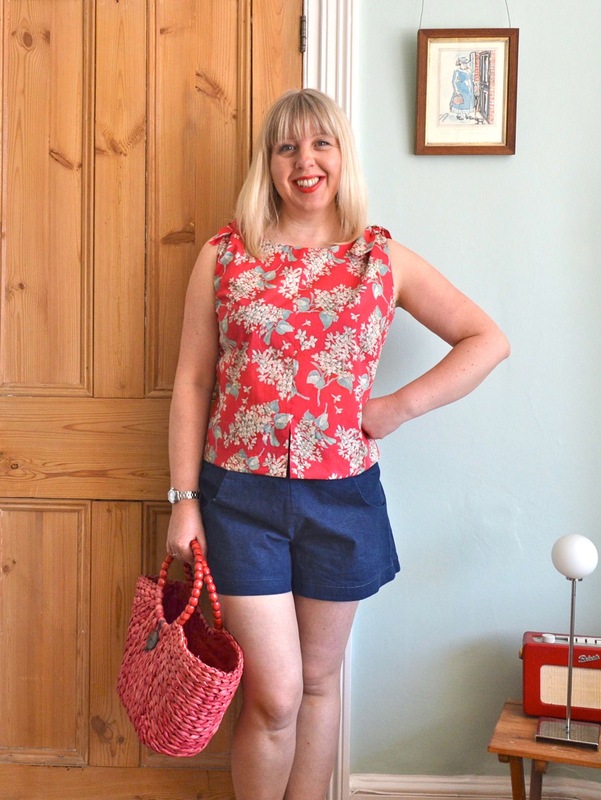 My NL6217 polka dot denim skirt should also get a mention as it was such a wardrobe staple over the summer. The fabric has a great stretch to it, so it's both comfortable to wear and a flattering fit. This Vogue reproduction pattern (V8875) has only been worn once as it's very dressy, but I still want to include it as I received so many compliments when I wore it! 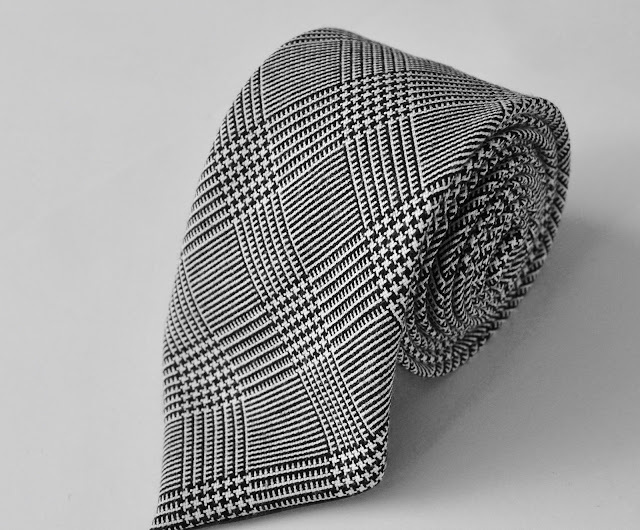 It's made from a gorgeous luxury crepe, so it hangs beautifully and has a very polished look. I also worked really hard to perfect the fit and feel really fabulous in it! Made using a Woman's Own vintage pattern, this has been a surprise hit as it's more of a boxier fit than I'm used to. 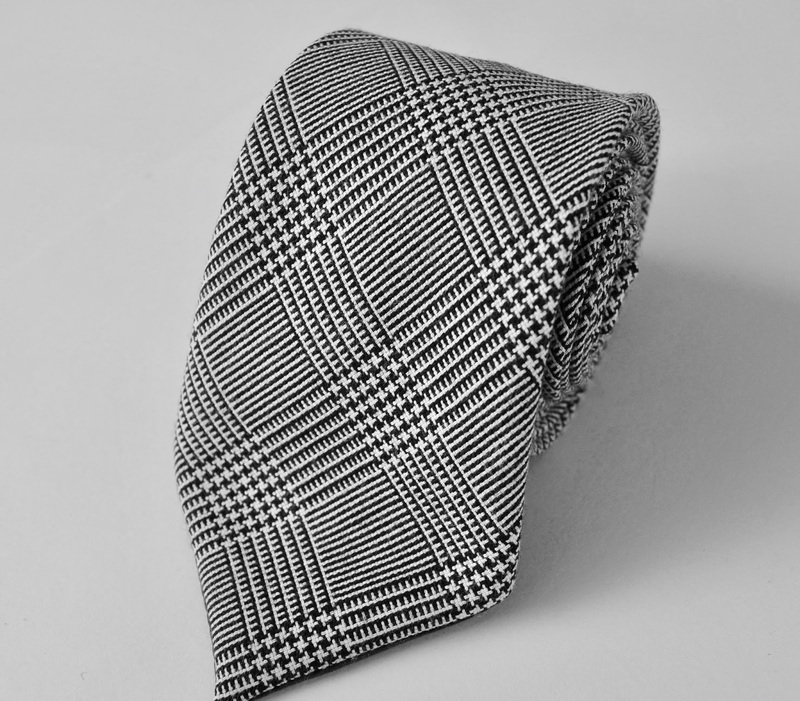 The cute shoulder ties are a lovely vintage touch and I found myself reaching for it again and again over the summer. The lush Liberty fabric doesn't hurt either! This was made to replace a much loved, very similar top and is a big improvement on the original. 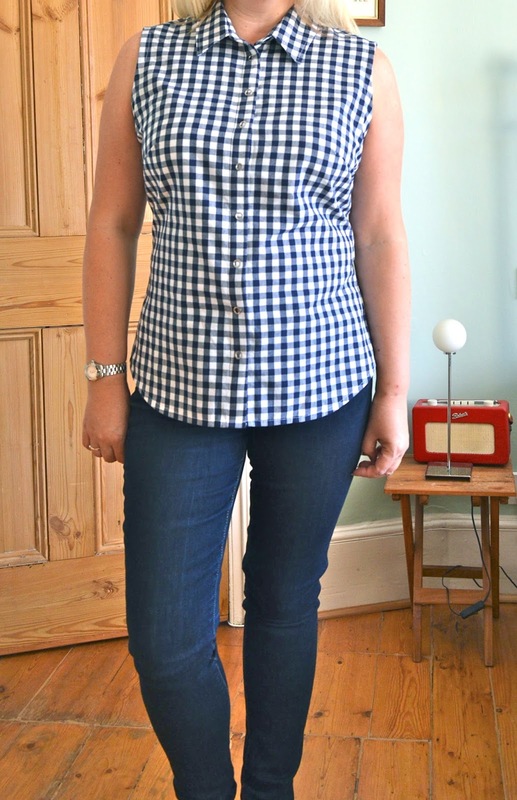 It's made using the Sewaholic Granville pattern, which is a great fit on me, and the 100% cotton gingham is a lovely quality. In fact I'm wearing it as I type this (underneath a jumper)! There are only two, neither of which has been an outright disaster. Despite me falling for the draped style of this Maria Denmark pattern, it's still a bit too grown up and slinky for me, hence it's only been worn once. I do really like the side pleat detail though, so may well just shorten it into a top. Teamed with a plain skirt or jeans, I'm sure it would get worn a lot more frequently. This can be a nice easy job for the New Year! I've worn this pattern a couple of times but the fit has never been quite right. It's a nice pattern (original pattern review is here) but needs a bit of tweaking to get it to fit me properly: I'd need to do an FBA (Full Bust Adjustment) and lengthen it considerably. 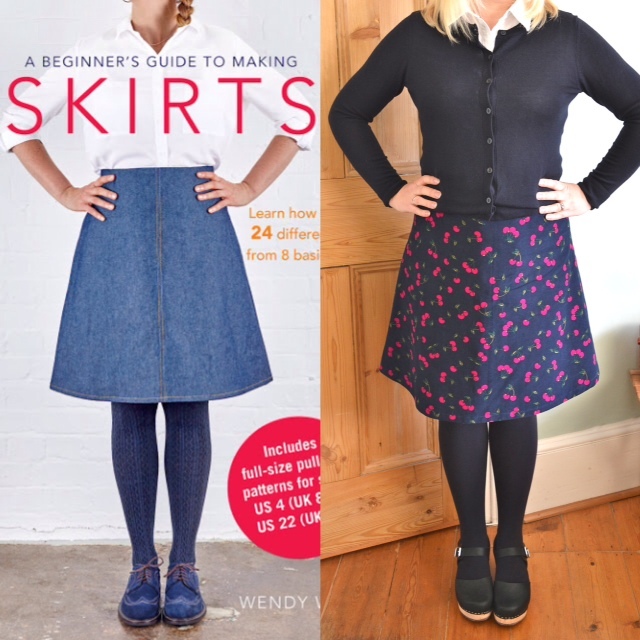 Only two minor fails then, which I consider pretty good going for a whole year of sewing! What have been your biggest hits (and misses) of 2016? And which patterns have turned out to be unexpected gems?! After lots of enjoyable research and a very wearable practice run, my disco-style gold top finally went on its first outing this weekend. The event was a friend's 50th birthday party and the dress code was Studio 54/disco inferno. 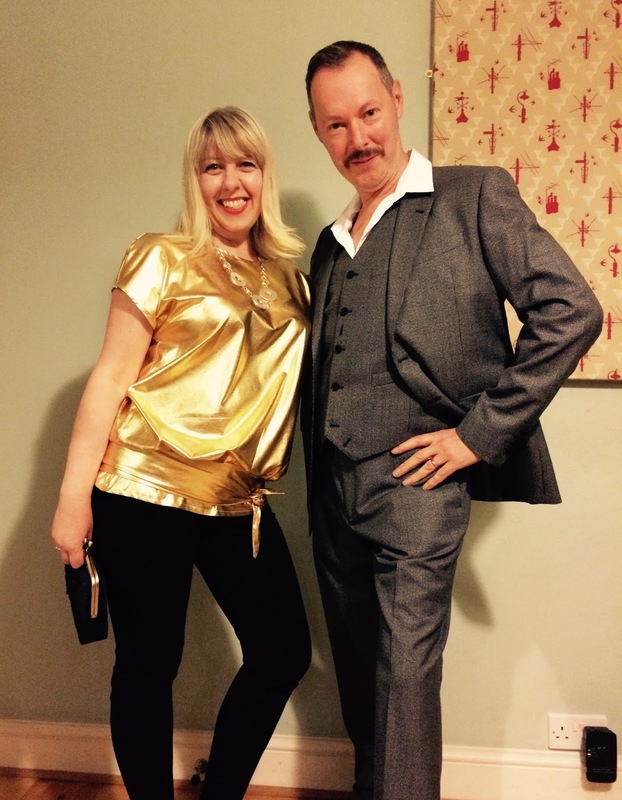 There was lots of metallic on display and a fair few three-piece-suits, so we blended right in. Jon even grew a moustache especially for the occasion! 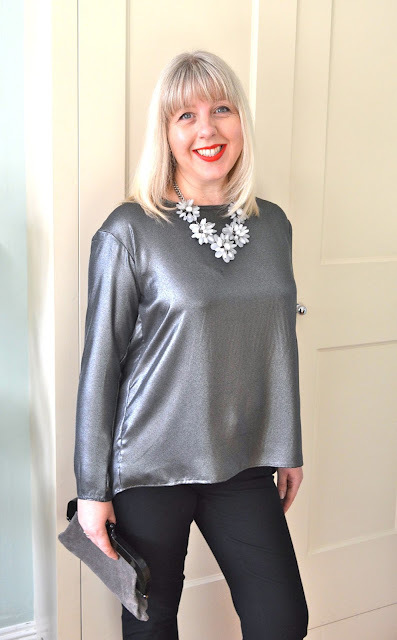 Taking inspiration from images of a disco-fabulous Farrah Fawcett dancing at Studio 54, I used the self drafted Anita Tie Top from the Sew Over It Vintage book as my starting point. I made a few changes from my practice version, but not as many as I'd envisaged. I lowered and widened the neckline slightly, lengthened the top and straightened the side seams for a more voluminous effect. I ended up keeping the bottom band that I'd planned to discard, as it does give the top a nice shape. The fabric is a Viscose Foil from Ray Stitch. There is a slight stickiness to it when you press it, so I was very careful with the iron. Apart from that it was surprisingly easy to sew with. The seams are unfinished (the fabric doesn't fray) and the neckline is simply turned under and top stitched. 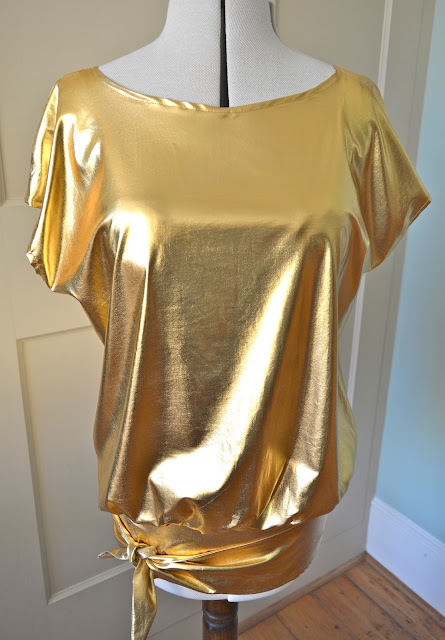 There's a tiny bit of neckline rippling going on, but I figured the gold blingy-ness would distract the eye! The fabric is reasonably wide (150cms) so I managed to make the entire top from just one metre, yay! 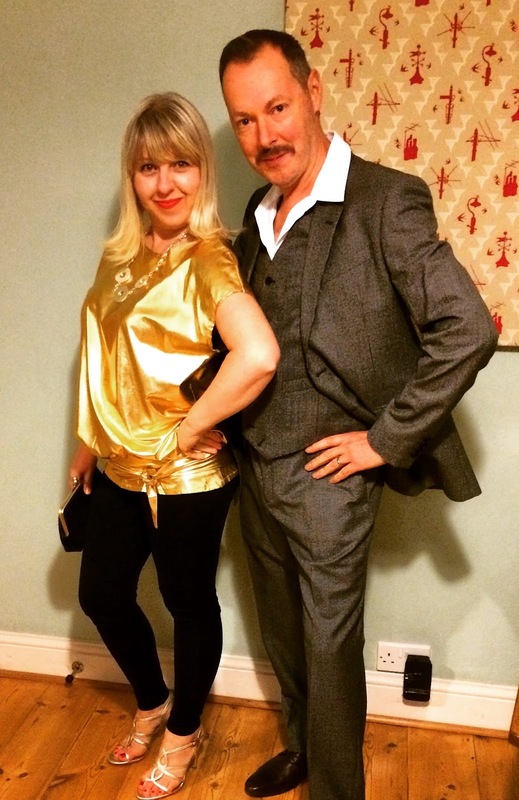 Me and my beau, suited and booted and ready to party…. 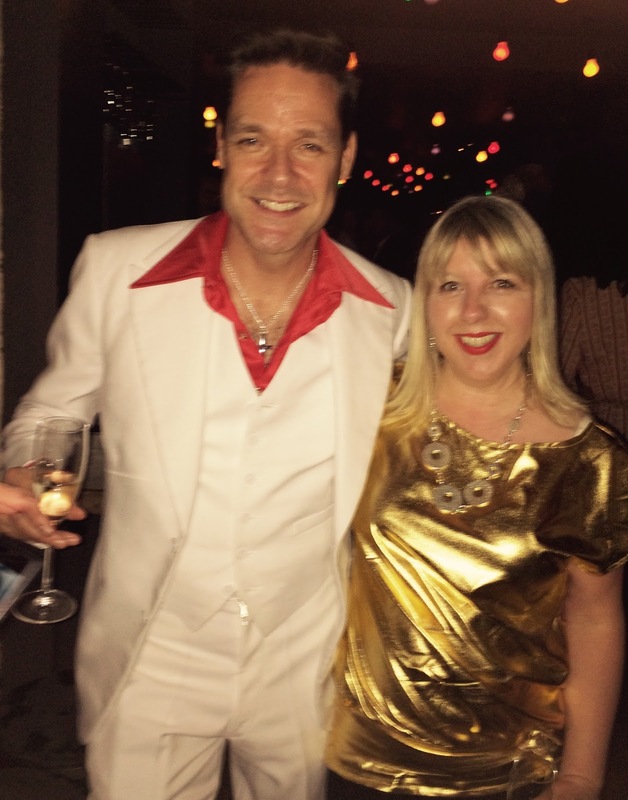 …and a bit of a blurry one of me with the birthday boy, giving John Travolta a good run for his money. Have a good day! 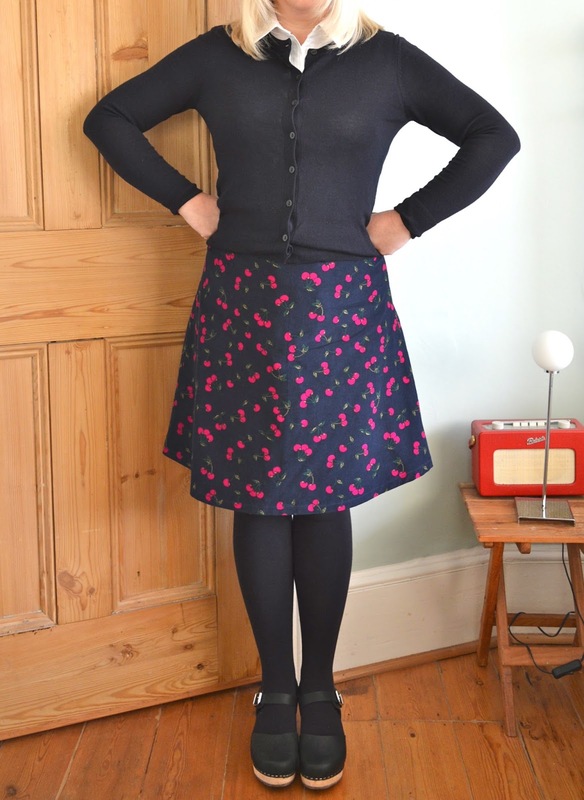 Hot on the heels of my first version comes my second Rusholme skirt from A Beginner's Guide to Making Skirts. This time I omitted the front centre pleat, making this an even easier skirt to sew - it barely took an hour in actual sewing time. The fabric is the cutest cherry print needlecord which Marie kindly picked up for me from Leicester market. I love it! Because needlecord has a tendency to stick to your tights I lined this version with some lovely quality Venezia lining, gifted to me by Jo Sews when we met up on Goldhawk Road last year. I used this method for adding it, simply deducting the length of the facing from the top of the skirt pieces when I cut it out. It's such a perfect little winter skirt, I know I'll be wearing it a lot. And as the background colour to the cherries is navy, it will match everything. Obligatory hands-on-hips book cover shot!